This can be a lifesaver for a meat and potatoes man (or woman). Cook the bacon in a skillet until crisp. Chop and reserve. Pour off the fat from the pan. Measure 2 tablespoons of bacon fat and return to pan. Sauté the cooked rutabaga, stirring occasionally, until browned. Add onion to the skillet with rutabaga and sauté until the onion is soft. Add the reserved bacon and the salt and pepper and cook until heated through. Makes 5 servings of ½ cup. Some sources list the carbohydrate count for rutabaga as being higher than that for turnips; some list them as being about the same. I prefer rutabaga as a potato substitute because it is a bit milder and the texture is more like potatoes, but rutabagas and turnips can be used interchangeably in most recipes. Buy the smallest, freshest rutabagas you can find. Fresh ones will be heavy for their size and they will feel firm to the touch. Avoid ones that have been waxed to give them a longer shelf life; they may feel hard but the older they are, the stronger they will taste. Try this when you are missing those hash browns and home fries. They may not pass for russets, but they are very much like Yukon gold potatoes. Unless you tell them, your guests may be convinced that they are eating potatoes. Notes: Adding walnuts in the shell to the cooking liquid will neutralize the odor of cooking cabbage; I have discovered that it also helps counteract the turnip or cabbage flavor of similar vegetables, like cauliflower and rutabaga. Lemon also helps to neutralize strong flavors. Changing the water once while boiling makes them even milder. If the recipe you will be using calls for cream, rinse the rutabaga well after draining to remove any trace of the lemon so the cream won’t curdle. Makes 5 servings of ½ cup each. Disclaimer: I will receive a commission from sales of the book above. 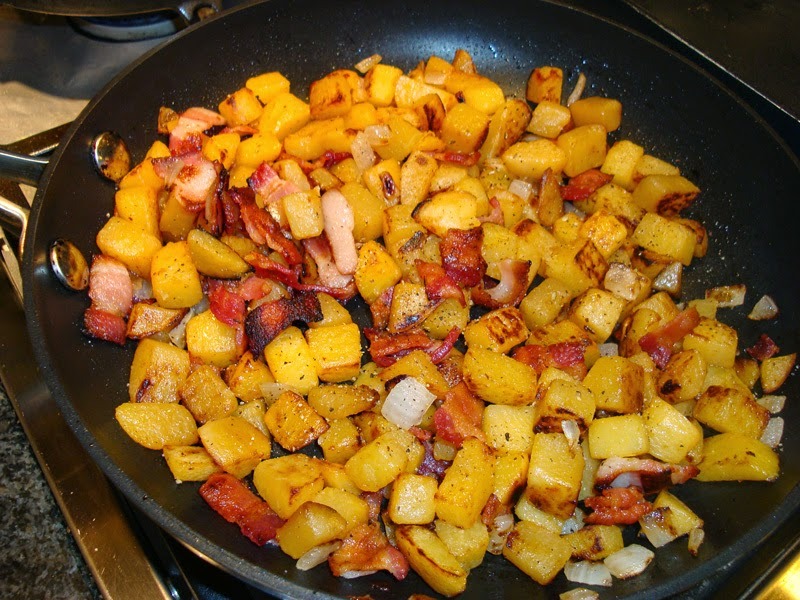 Bacon, Home Fries, Walnut Trick. Bookmark. I want to make these, but can't find Walnuts in the shell right now, they say only at Christmas and Thanksgiving, can I use unshelled? or just the lemon will that work? Hi Kimley 58. I usually stock up on whole walnuts in the fall and keep them in the freezer. I don't know if shelled walnuts will help or not–I have no idea why the trick works anyway, just that it does! If your rutabagas are small and fresh, they will be fine. Try the recipe again when you have whole walnuts and see if you like them better.